Birthday Daisies Daisies are bright, cheerful and have for long been a favorite with many people making them a very popular birthday flower. 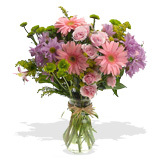 Birthday daisies are ideal for a young female as they are innocent and fresh and in appearance. Sending a birthday flower arrangement shows the recipient your care and shows your affection for this person. For someone aging but young at heart daisies would be the perfect birthday flower to give.